Super-spy Ethan Hunt (Tom Cruise) has retired from active duty to trains new IMF agents. But he is called back into action to confront the toughest villain he's ever faced - Owen Davian (Philip Seymour Hoffman), an international weapons and information provider with no remorse and no conscience. 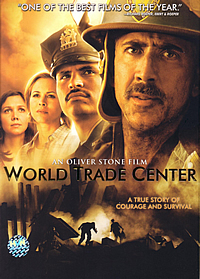 Hunt assembles his team - his old friend Luther Strickell (Ving Rhames), transportation expert Declan (Jonathan Rhys Meyers), and background operative Zhen (Maggie Q), to rescue one of his very own trainees, Lindsey (Keri Russell) who was kidnapped while on a surveillance detail of Davian. It soon becomes evident that Davian is well-protected, well-connected, and downright malicious, forcing Hunt to extend his journey back into the field in order to rescue his wife, Julia (Michelle Monaghan), and uncover IMF double agents in the process. After numerous years in production limbo, the third instalment in the most iconic series in today’s movie history, "M:I:3" finally comes to life under the hands of J.J. Abrams, the creator of "Alias" and "Lost". Perhaps it’s the magical hands and brains of Abrams that helps turn this movie into being more intricate and realistic as compared to the previous two. Brian De Palma’s version was a tad too detach from reality while John Woo’s take was less brainy and populated by more doves than agents. In "M:I:3", Ethan Hunt is longer just a secret agent without a face or identity, he studies “traffic” for a living and is deeply in love with a woman, on the way to start a family while secretly harboring the secret of his “agent” role in IMF. But the greatest payoff for the audience perhaps is Hunt facing his most powerful nemesis to date, Owen Davian. Davian played so nastily by Philip Seymour Hoffman (“Capote”) is a joy to watch. Watch out for the confrontation scene between Hunt and Davian on an airplane. And you will realized why Hoffman deserved the best actor award in the Academy. Abrams finally solved the case of the 'missing' agents because in "M:I:3", it’s not just about Hunt alone. He is accompanied by Zhen (Maggie Q), Declan (Jonathan Rhyes Meyers), his apprentice Lindsey (Keri Russell) and Hunt’s recurring buddy, Luther played by Ving Rhames.If you are still not impressed by the above list, add on Laurence Fishburne and Billy Crudup. Equally exhilarating is the numerous action sequences that will lift you out of your seat. How about a freefalling act in Shanghai or a huge Davian’s escape sequence on the Chesapeake Bay Bridge to whet your craving for action pieces? 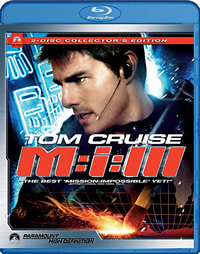 Despite Mr Cruise’s couch jumping habit and frequent insensitive comments on behalf of his Scientology’s belief which resulted Paramount from ending their collaboration with him, "M:I:3" is definitely one of the best entertaining action set piece in recent years. At the end, it not only marked Tom Cruise as an all-round performer but also J.J. Abrams first successful foray into motion picture. Director J.J. Abrams and Tom Cruise As They Discuss Their Experience Making M:I:III - What do you get if you put two very nice guys together? The very nice J.J. Abrams and the very nice Tom Cruise has a lot of very nice things to say about the production process, crew and cast in this commentary track. Everything just looks and sound nice. Go Behind the Camera with the Making of the Mission (High Definition) - This 28 minutes making of goes to show how far Hollywood is willing to do for the sake of art. How about building a bridge from scratch or creating a gigantic wall? In addition, you get to see an NG scene showing Maggie Q crashing that "nice" car. The latter is cute. Inside the IMF (HD) – A 21 minutes features that introduces what goes behind the Impossible Mission Force and interviews with the different cast members. Never-Before-Seen Deleted Scenes (HD) - Consisting of 5 short scenes without J.J. Abrams' commentary however, not really crucial to the whole plot which is why it's left on the cutting floor. But the "Musgrave cementery conversation" did shed some light between Crudup and Russell's characters. Mission Action – Inside The Action Unit (HD) – We go behind the scenes as to how the action sequences were choreographed and Tom Cruise showing his commitment by attempting all the stunts by himself. Visualizing The Mission (HD) – This 10 minutes feature showcase the pre-vis system which is used to layout the complicated action sequences before the actual shooting. Mission: Metamorphosis (HD) – Curious as to how they create the masks in the movies? This short featurette shows you how the mask is ‘created’ by the crew and J.J. Scoring the Mission (HD) – An interview with Composer Michael Giacchino and his take on the new Mission Impossible movie. Launching the Mission (HD) – See how popular Tom Cruise is around the world as snippets from the M:I:III world premieres in New York, Rome, Paris, London and Japan is shown here. Moviefone Unscripted: Tom Cruise / J.J. Abrams – We have Tom Cruise and J.J. Abrams interviewing each other with questions sent in from the general public. Excellence in Film - Footages of Tom Cruise winning the Stanley Kubrick Britannia Award and montage from his past movies. Generation Cruise - This is lifted from a tribute shown at the 2005 MTV movie awards. Nothing spectacular, just a 3 minutes montage consisting of scenes from past Cruise's movies again. Four Theatrical Trailers, TV Spots and a Photo Gallery round up the extras in Disc Two. Crank up your Dolby Digital surround system for best results is what I recommend as this M:I:III disc is going to blow up the neighbourhood. Bass is deep and powerful especially during the bridge scene. This Blu-ray video transfer is clear and colours are well-defined. The Shanghai night shots are nicely portrayed. M:I:III holds up well in high definition and goes to prove both Paramount’s money and your money is well-spent.